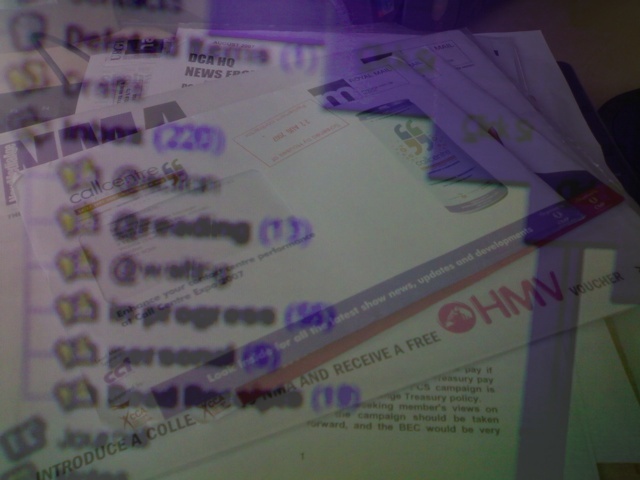 … from a few weeks holiday to find a mountain (okay a small hill) of email despite judicious use of autodelete filters, and a pile of (mainly junk) mail. Still it all takes time to wade through. – why can’t public sector webbies all be friends instead of carping? – how do you explain to customers that their website might not be the most appropriate online channel to use? More on these, and others, soon. Its recess, quiet(er) in the offices of Whitehall than usual, and a great time to catch up on all the niggly jobs that have been sitting around in the inbox for a while. Not a great bunch of subjects to write about I’m afraid. I’m off on holiday myself next week and one of the things I’ve been trying to finish up before I go away is to make sense of the ream of paperwork I’ve got knocking around relating to website rationalisation (or web rat as its ‘affectionately’ known around these parts). The project has virtually become (another) full time job for me over the last eight months or so and for most of that time its all been about ‘closing websites‘ as my regular reader, and other webbies around Whitehall, will recognise with a groan. I’ve previously bemoaned the lack of a coherent picture of government web/digital strategy. Its not that we don’t between us know what the constituent parts of it are, its just that perceptions are skewed by the headline grabbers. But as the work moves towards identification of what information and applications should migrate into Directgov or Businesslink (known as website convergence in Whitehall, or webc.. oh, you get it..) we have to work out what to do with what will be left. Simon D has already pointed out the problem of losing permalinks, especially where content is cited in the official record of parliament. There is a real danger that this will be excaberated in the short term as sites are rationalised – though in the long term it should be easier to manage. I’ve been involved in some discussions about how to resolve this. I’d love to tell you about it. Its not that I can’t (though maybe that wouldn’t be a good idea) its just that I don’t understand how to explain it. I’m convinced it will work, but not being a techie I got lost when being told the difference between a URL and a URI. Needless to say, the scale of the task is large. But the approach seems robust. This is all good, and starts to clarify what we are about for the future. Still can’t help thinking we’re missing a trick though. It feels like a classic civil service problem solving scenario: issue identified, official(s) commissioned to draft guidance, draft circulated, a few comments received, then its policy. While I don’t have a problem with that in principle (and the people doing the legwork know what they are doing) it just feels like it goes against the grain of what we are about – webbies, online experts, social media savvy. Shouldn’t we be using the very tools we evangelise about on a daily basis to harness the collective knowledge of the community and build this vision together? By ‘we’ I don’t just mean webbies. There are plenty of other interested parties in and around government who have knowledge, expertise, experience and views about the best way to do all this stuff. We should be harnessing that, not imposing solutions – however good they appear. I’m rambling know and losing focus so I’ll stop for the moment. Suffice to say I think its moving in the right direction but it needs something else, a commitment to change and invest in improving how we do all this. Not sure what the answer is but I have some ideas. They can wait for another day.